For weeks now I’ve thought it might be a good idea to share this version of my classic oatmeal millet raisin cookies, but I haven’t been able to make myself write the post. Instead I’ve been stuck at a quirky road block: I’m stymied by a perverse tendency on my part to stop making whatever it is I post on the blog. Since I really like these cookies and have been eating them for a lot of the winter, I didn’t want to take the chance that if I posted the recipe I wouldn’t want to eat them anymore. When I notice behavior like this in myself, it tends to send me into bouts of silliness. In an attempt to cajole myself into sharing the recipe, I thought of naming these cookies after a quirky time travel movie from the turn into the 21st century called Happy Accidents, if only because the idea of them would have seemed preposterous, even impossible until I impulsively decided to try it, and the seemingly impossible became the actual, even the new standard, for how to make a cookie in my kitchen. In the end, though, it wasn’t the silly connection with the movie that tipped the scales. It was the trees in bloom all over the neighborhood with their sudden riot of white, pink, crimson, orange, fuschia, lavender, and all the shades in between. How freely they burst into such amazing color to awaken the gray days from sleep, and how willingly they spill that color, when the blooms are done, to adorn the dark wet sidewalks on our morning and evening walks. So generous, no worries about what will come next. Just abandon in the beauty of the moment, the turning toward the sun and more light, and the promise of shade when at last they all leaf out. Thanks to these trees, if you have a food processor, and you’d like to travel back a couple of months with me to when I first discovered the crunchy versatility of millet in cookies, you are in for a future happy accident of your own. The food processor, powerful though it may be, barely nicks any of the tiny millet grains at all–just like petals fall from the tree miraculously intact, they, too, retain their tiny integrity. But whirring the millet around with everything else gives them a slightly soft, still crunchy very flavorful character that’s nut-like but not nut-like. A paradox in a cookie, if you will. 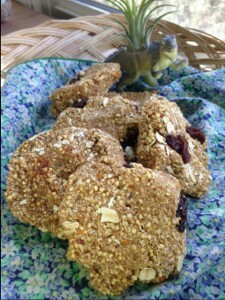 Like petals that carpet the mundane ground with splendor, the addition of millet turns these run-of-the mill oatmeal cookies into a unique delight. I hope you’ll give these slightly off-beat cookies a try, even if they didn’t come from 471 years in the future, and they probably won’t last more than 48 hours, if you’re lucky enough to have some self control. Honestly, I never measure the amounts I put in, so these measurements are approximations. If you can’t eat oats of any kind, I’m sure this recipe would work with quinoa flakes. Put hazelnuts through dates into the food processor fitted with the S blade and process for a minute or so. Then add everything but the raisins and process some more. When the mixture forms a dough that begins to pull away from the sides, stop. You’ll have a textural dough with small bits of nuts, orange peel, oats, etc. Take the S blade out and fold in some raisins with a fork. Form into cookies and bake at 350 on a baking sheet lined with parchment paper for about 16 minutes. Makes 8-10 cookies. *If you don’t want to use raw millet, you can substitute about 2/3 cup of cooked millet. I do that all the time if I have it already cooked. If I fear loss, it’s hard to change. If I’d finally like to get “it” right, whatever that may be, it’s also hard to change. But getting stuck in such reality frameworks can look pretty hysterical from the outside, as this scene from Happy Accidents reminds me. I turn to it for a heart-rending laugh. But I turn to the trees in bloom for inspiration about how to open up and give in the moment in spite of myself, pass along something sweet, whatever it is, for however long it lasts. That none of what is sweet may last forever is often the reason for its sweetness, its fleetingly delicious beauty. Oh man. I also suffer from the blogger’s lament of mysteriously discontinuing regular consumption of the recipes that I blog. Menu Plan Monday posts are in part an attempt to remind myself to work old favorites into our regular meals! I am glad I’m not the only one who does this. And these cookies look stellar. I love the idea of working millet, with all of its textural benefits, into the cookie. 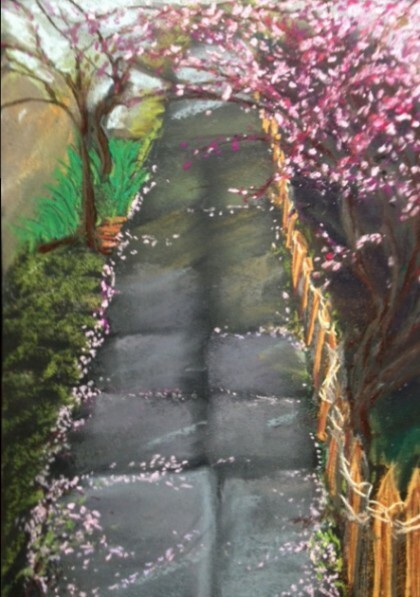 I love the pastel, too – with all the tree sprinkles on the ground, looks like a path I’d love to walk. Well, Veronica, pretty funny we are all in the same blogging boat–I bet Susan does this too– you made me smile about the scientific reasoning behind it. Double blind random blogging blahs?? 🙂 I have used both currants and craisins in the cookies and both are wonderful, so go for it! 🙂 So happy you like the pastel. I sure love walking on petals. Hi Maria, having read your post and the rest of the comments, I see that I’m not alone in quitting recipes that I’ve posted! Not always, but often. Why does that happen?? Anyhow, hopefully this will be one of the exceptions for you, because these cookies look amazing, and I’d hate to see you give them up just because they went on your blog. I’m really looking forward to trying them, especially now that I’m tolerating oats. Also, I think millet is one of the most underrated grains out there, and I’m glad to see it getting its moment in the sun! And, as always, thanks for featuring your beautiful artwork–it so perfectly captures the fleeting abundance of early spring! Thanks Lee! You might be happy to hear I just made another batch before I responded to your comment, so hopefully these cookies have gotten past the blogger’s gauntlet! I am also happy that you can now tolerate oats so you can try these out. They are good “on the go” cookies, which might work nicely with your busier days. Happy Accidents is a truly quirky and weird movie, but I just loved it. Marisa Tomei is wonderful in it. 🙂 And so glad you enjoyed the sketch! Is there liquid missing from this recipe? Is the banana enough to moisten the entire recipe? Good question Erin! Yes, if the banana is ripe enough and there is enough of it, along with the juice from orange sections, it should be enough. If it seems so dry it won’t hold together at all, add a splash of water or non-dairy milk of your choice.